Ian is a young showman with a special gift. Yes, he is an accomplished juggler, but that's not the gift to which I refer. The gift that makes him special is telekinesis--the ability to use his mind to make things move. Ian is not yet aware of his gift, but it puts him in grave danger. It makes him `D'Natai'--Accursed--a target of the Heralds, immortals who are able to fly and wield enormous power through the use of a mineral known as dianthium. The Heralds want nothing more than to suppress and control all who possess such gifts as Ian's. Opposing the Heralds are experienced free D'Natai such as Jolland, a friend of Ian's family, who roams the land rescuing young Accursed before the Heralds and their henchmen the Wardens get to them. Jolland maintains an underground network of `Packs' of her charges, and when Ian first unwittingly displays his gift, it is Jolland who manages to rescue him even as the Wardens are closing in. Therein begins the tale. Ian is whisked away to a `Pack' of D'Natai living underground in the sewers of the capital city of Lodric. He is brutally hazed and trained in his skills by Della, the cynical and headstrong pack leader. Though Jolland's goal is merely to allow the D'Natai to survive and remain out of the hands of Lodric's ruling Heralds, Della wants more. She wants revenge. And she recruits Ian to help her. 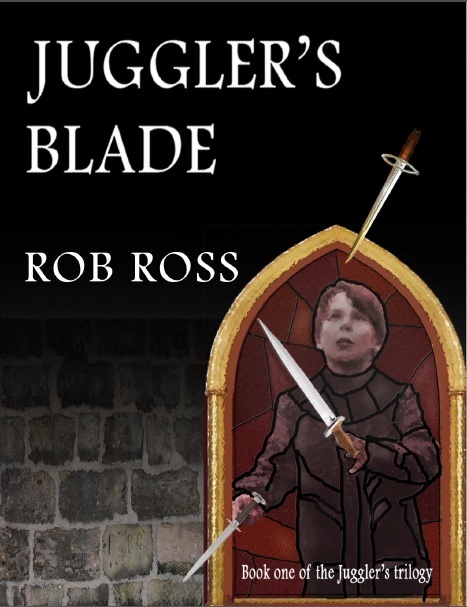 `Juggler's Blade' is a fast paced fantasy tale of suspense and intrigue. Rob Ross builds the story gradually, exposing the reader by degrees to the rich and elaborate fantasy world he has constructed and to the story arc. The four fellow members of Ian's pack are all very different characters, and Ross is deft at developing their personalities. And though the writing style is sometimes wooden, occasionally clichéd, the plot grabs your interest from the start and keeps it as the tension builds. By half-way through the book I didn't want to put it down. `Jugglers Blade,' published as an e-book only, is the first of Ross's `Juggler's Trilogy'. I heartily recommend it, and look forward to reading the second and third installments.